Kimber flew as a fighter/chasse pilot with both the French Air Service – escadrille Spa. 85 – and the U.S. Air Service, the 22nd Aero Squadron. With Spa. 85 he was the first of the escadrille’s pilots to fly with their new ‘Joker’ or ‘Madness’ insignia (La Folie) in late July 1918. The insignia is still in use today, sported on tail-fins of the French Air Force escadron 3/13 ‘Auvergne’ fighter instruction unit based at Tours. The U.S. Air Service 22nd Aero achieved a remarkable service record in the war. In spite of its late start to the campaign, only being operational on the front from late August 1918, it scored the fifth highest total of victories – 43 – of all the U.S. Air Service pursuit squadrons. 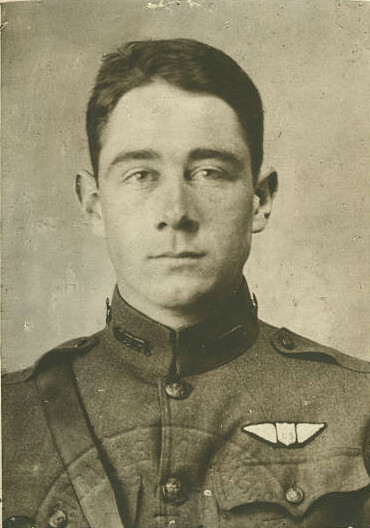 Kimber was one of 10 pilots lost to the squadron in the course of the campaign. The lineage and history of the 22nd Aero was consolidated with those of the 22nd Army Air Corps Observation Squadron in 1937. Today they form part of the 22nd Intelligence Squadron (22 IS), a non-flying squadron of the United States Air Force. It is assigned to the 707th Intelligence, Surveillance and Reconnaissance Group, Fort George G. Meade, Maryland.